Valentine’s Day is heading our way and we’re helping you get in the spirit with a whole stack of sweet DIY projects and gifts. The best part is that they’re all super easy so the kids can help too. Take this rather adorable hugs and kisses bunting. Easy to make, hang it high in your child’s doorway for a surprise welcome to Valentine’s Day when they wake in the morning. Or make it together and drape it over the table for breakfast. Either way, they’re sure to get the message that they’re loved. Find the downloadable template and all the other instructions over at Simple As That. Kids will love making – and solving – their own glittery heart block puzzle, but there’s no need to go weak at the knees at the thought of making them. A handful of supplies from your local craft store and the kids (with your help if they’re little and solo mio for the big ones) will soon be busy for an entire afternoon. 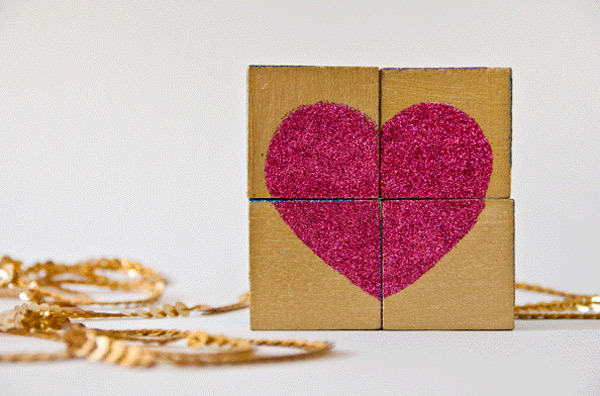 Find all the instructions for DIY glittery block puzzle Valentines at Studio DIY. Here’s one that’s so easy, even the littlest toddler can give it a go. It’s a pretty foldable heart with plenty of room on the inside for kids to write a sweet message to mum or dad or just leave their most creative scribble. Either way, it’s sure to elicit aaaaaws come February 14. The step-by-step instructions – all three of them – for folding envelope hearts are super simple to follow and you’ll find them over at Martha Stewart. 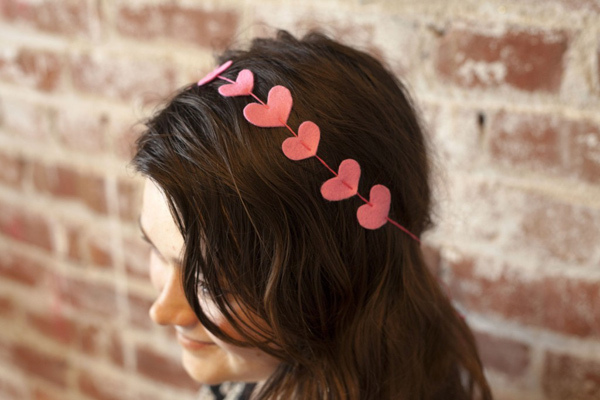 Wearing your heart on your sleeve is all very well, but how about wearing a whole string of hearts in your hair? Creativebug have all the instructions to make a pretty Valentine’s Day heart headband and it’s fairly easy, even for hopeless sewers like me. Now Valentine’s Day falls on a Saturday this year, so normal school, preschool and childcare rules about healthy snacks and lunches don’t apply. 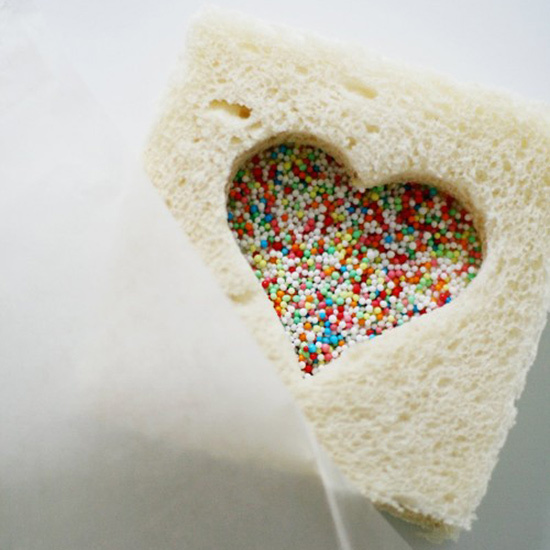 Which is rather lucky, because what kid wouldn’t love to tuck into a heart-shaped sprinkle sandwich for lunch, a la this sugary concoction we discovered over at German food blog Ohhhmhhh. All you need to pull it off at home is a large heart cookie cutter, white bread, butter and sprinkles (those last three things super rare in most homes these days but come on, it’s Valentine’s Day) and the kids will adore you forever. If a sugar sanger is the way to a kid’s heart, a hot cup of tea will usually get you a direct line to mum’s. But not any tea. Her favourite tea, tricked up with some heart tea bags that the kids have made themselves. Dead easy. Find out how to make these over at Tara Dennis. It’s true that you can see love in a person’s eyes – more so when they’re wearing heart shaped glasses. 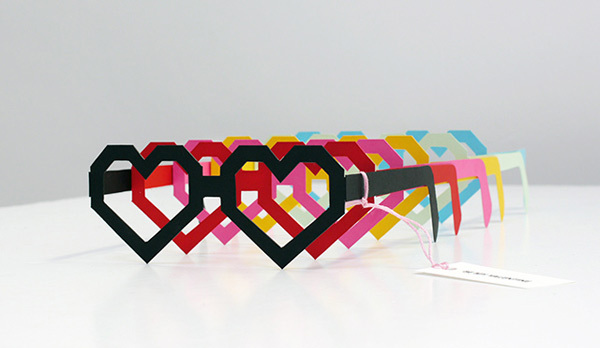 So dash over to Mr Printables and print off these super funky heart shades on some card. Then cut, fold… and the look of love can be in your eyes too. Yarn bombing is still a big thing where I live. 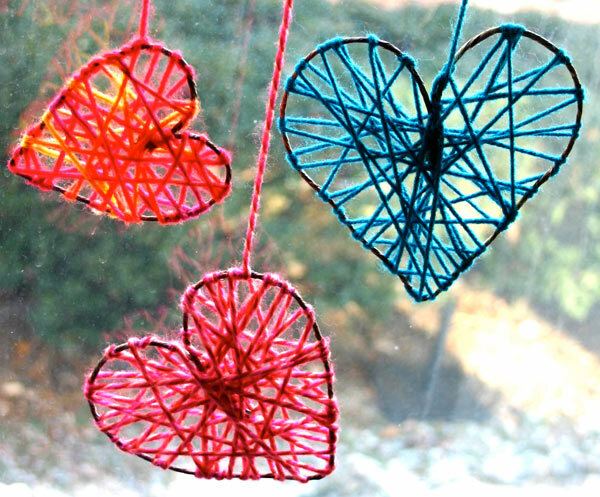 I’m not sure how far across the country, or even how far across Melbourne, it’s crept from my inner city haunts, but if you wanna get in on some hipster craft fun with your kiddoes, how about trying your hand at these yarn hearts. You can go the whole hipster hog and hang them from the tram stops and parking signs in your neighbourhood, or just be normal and hang them in your own window at home. Either way, you’ll need these instructions from Camilla Fabbri’s Family Chic blog. 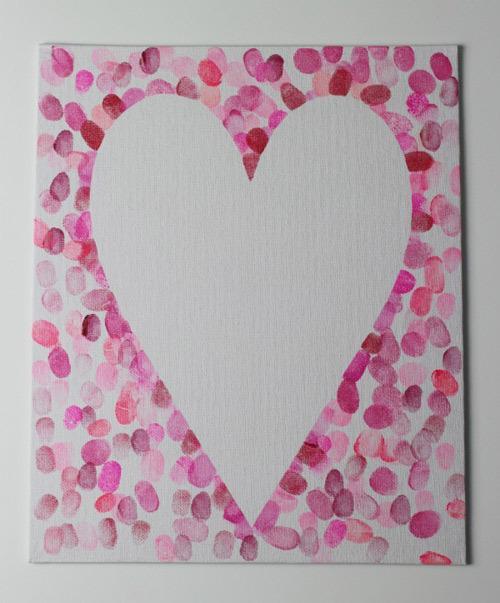 Here’s an easy Valentine’s Day project the whole family can get in on – a fingerprint heart work of art. It’ll decorate the house perfectly on the day, but it’s also a heartfelt memento for future years of just how absolutely teeny-tiny the kids’ fingers used to be. You’ll find step-by-step instructions at The Mad House. Finally, here’s a DIY Valentine idea I absolutely adore that’s perfect for boys, dads and anyone else who doesn’t get into the schmaltzy side of Valentine’s Day. 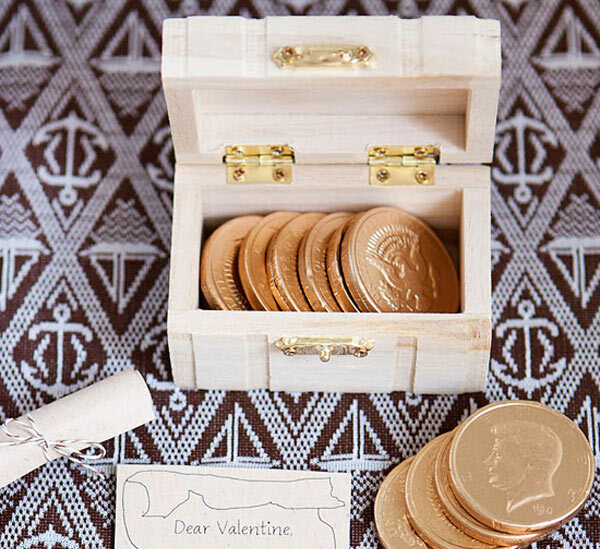 Letting them know they’re treasured without surrounding them in hearts or a sea of pink is as easy as throwing a few chocolate coins into a mini wooden chest – check your local craft store – or bag and adding a little treasure map, like this one from Armelle Blog. Leave your treasure chest plain, like this, or let the kids decorate it as they like. Then ramp up the creativity and make a Valentine’s Day treasure hunt around the house and garden. 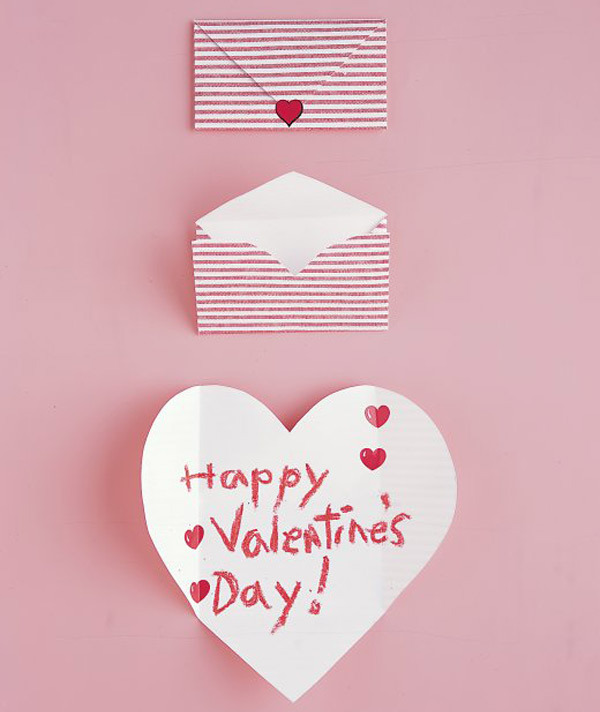 Happy Valentine’s Day crafting! Make sure to let us know in the comments if you tackle any of our projects. 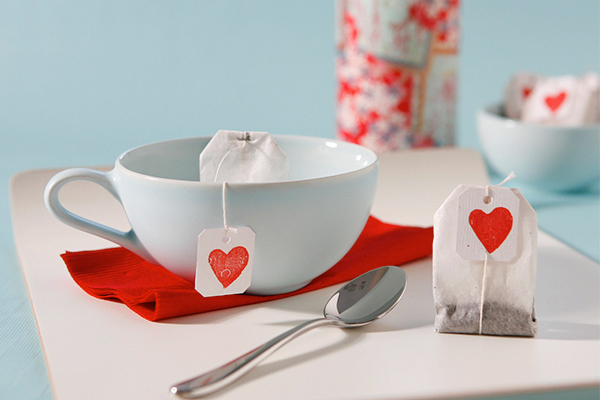 You’ll find more fun Valentine’s Day craft ideas in our previous posts.